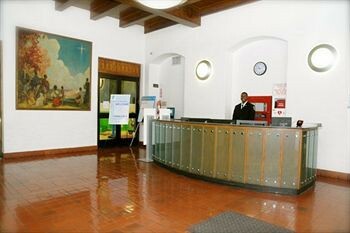 LocationLocated in the heart of Harlem, the hotel is within walking distance from the famous Schomburg Museum and Library and the famous 125th Street shopping district. The hotel’s vicinity also includes the legendary Apollo Theater, the State Office Building, the Abyssinian Baptist Church, Sylvia’s famous Soul Food restaurant, City College and many other historic places. The hotel is conveniently located near the numbers 2 and 3 or C and B subway lines and the cross-town and midtown bus lines.FacilitiesThe establishment comprises a total of 235 accommodation units. Services and facilities at the hotel include a safe, wireless internet access, a café and a laundry. Guests travelling in their own vehicles can make use of the available parking spaces.RoomsAll accommodation units feature air conditioning, central heating and a bathroom. In each accommodation unit, guests will find a fridge and a TV.Sports/EntertainmentThe establishment offers an indoor pool. Leisure options at the establishment also include a gym, a spa, a sauna and a steam bath.